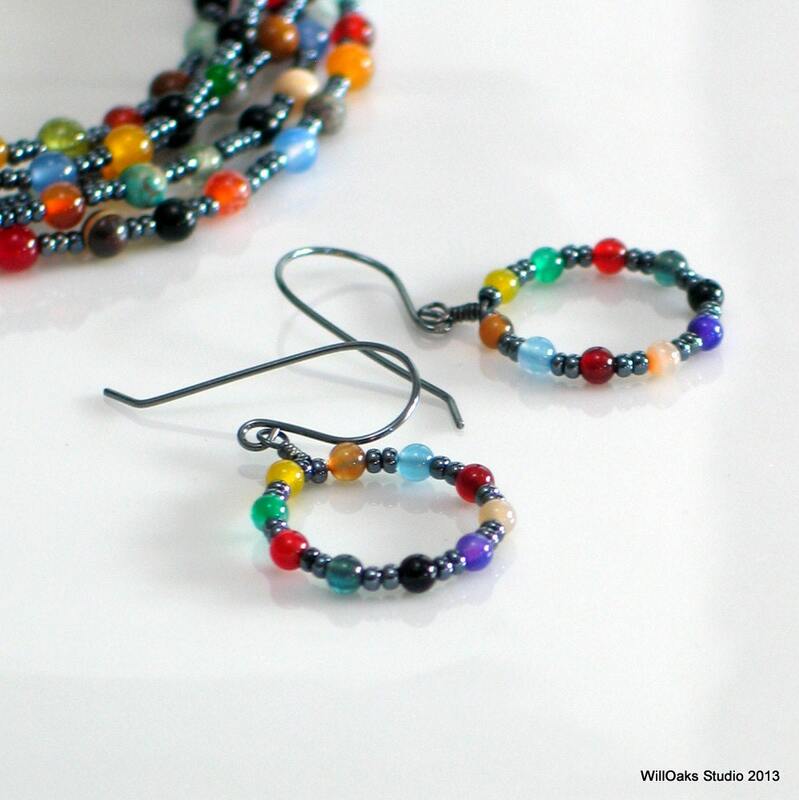 Colorful, dainty hoops mix shiny gray glass with a colorful collection of stone beads around hand made sterling silver hoops. Dark gray sterling ear wires, hand formed, tumbled, oxidized and tumbled again for dark shine, suspend these earrings for a total length of about 1 1/2" measured from the top of the ear wire. 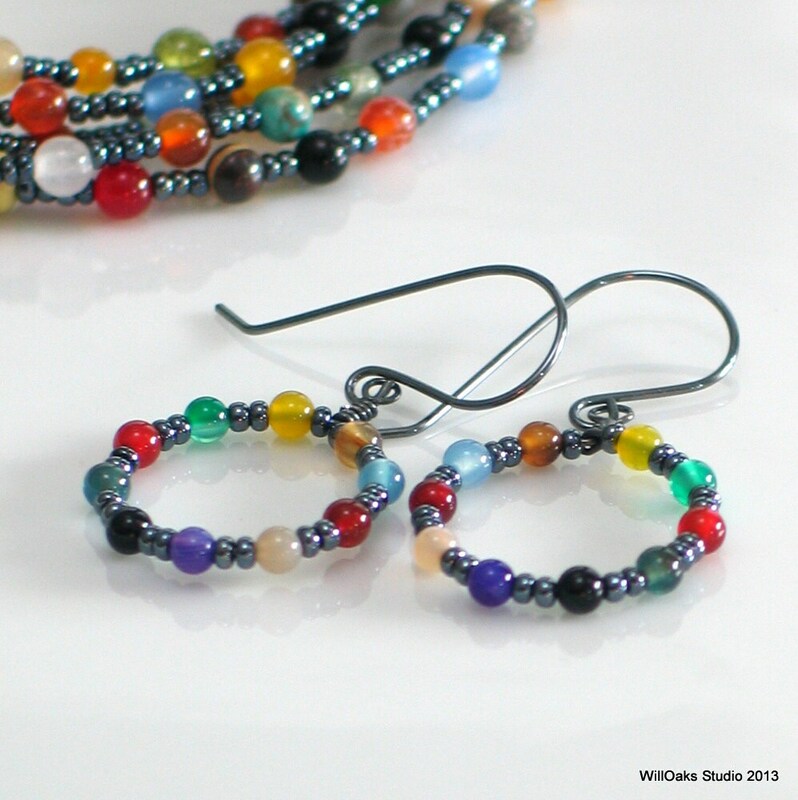 A part of my Tapestry Series, these earrings coordinate with other pieces in this series for a bit of Bohemian fun. 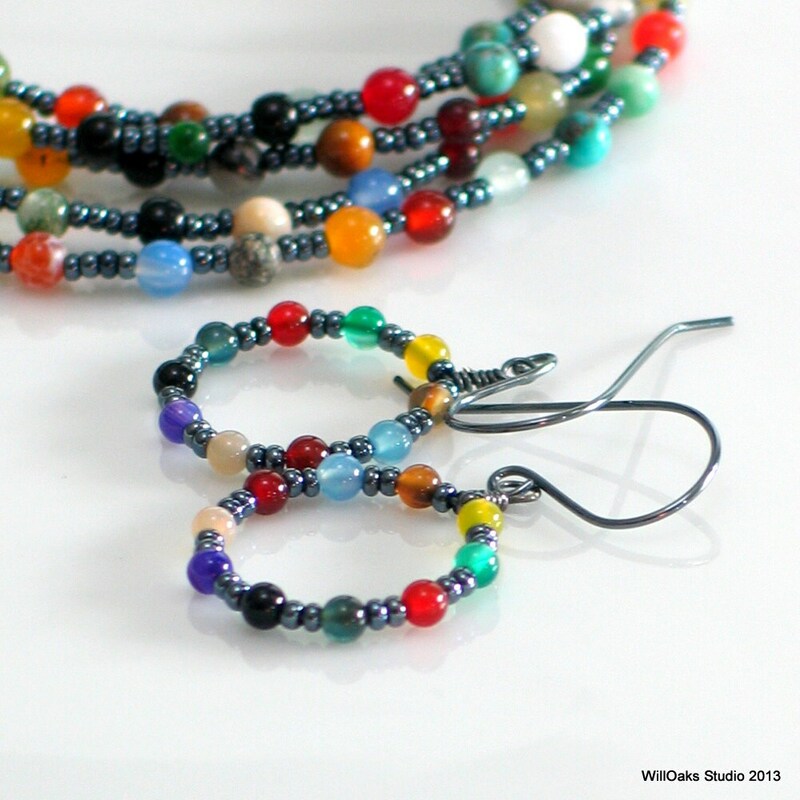 Designed to coordinate with the the dark gray hematite version of the long chain and multistrand cuff in the WillOaks Studio "Tapestry Series" or fun and colorful on their own! While each pair features stones arranged as mirror images, no two pairs will be the same. 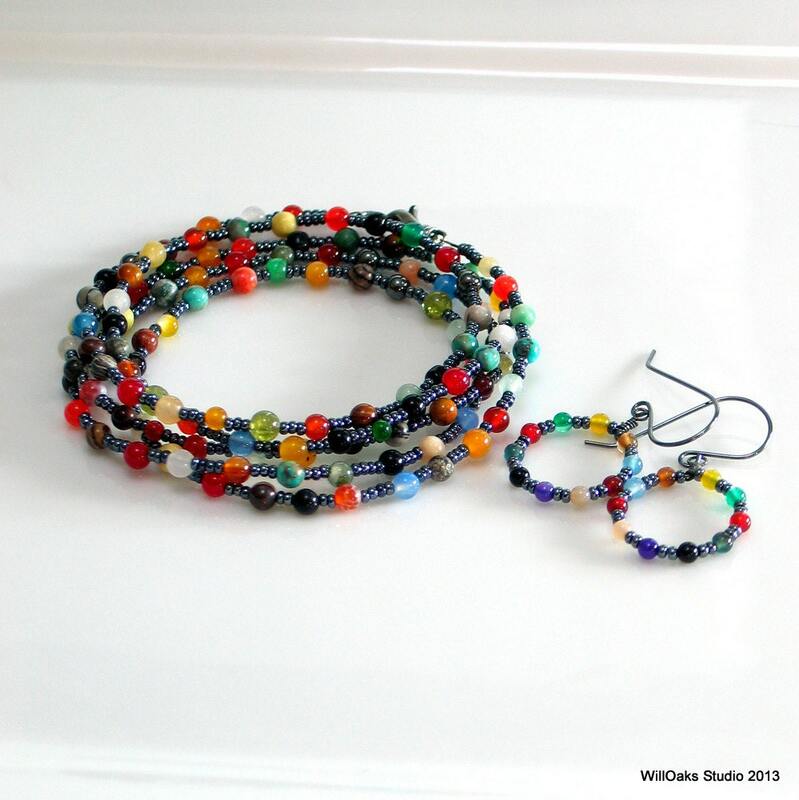 If you order the earrings together with either a cuff or long chain, I'll be sure to coordinate your earrings but random, bright colors is the fun of this series of pieces. 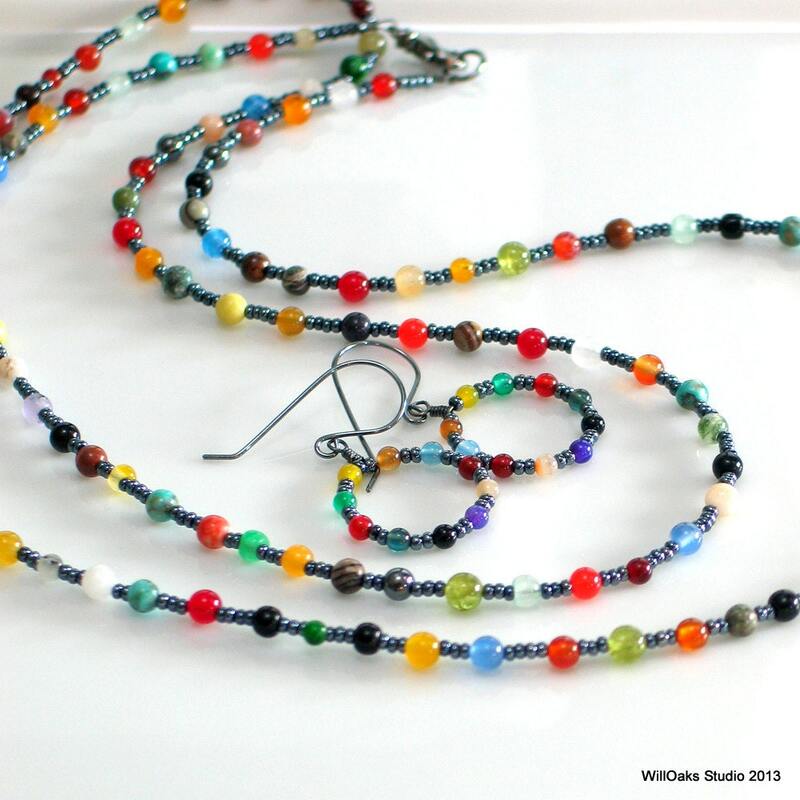 3 mm stone beads are have tiny shiny dark gray Czech glass seed beads between them. The hand formed hoop captures the arrangement on oxidized sterling wire. Shown here with the coordinated chain. Made to order. WillOaks Studio earrings are boxed in small custom boxes or, if ordered with a bracelet or necklace in this series, are displayed on custom cards that are included in the larger box. What a fun gift to give or to get during the gray days of winter!! Please visit the front window of my studio here and thank you for stopping by!